Leaf Mountain township (township 131, range 39) was organized on January 7, 1874, under the name of Dovre Fjeld, a name which would indicate that a majority of the petitioners were Norwegians. The first election for township officials was held at the house of Ole Bakke on the 29th of the same month. The present name of the township was given it by the commissioners on March 18, 1874. The petition for the organization of the township was dated September 6, 1873, and contained the following signatures: Ole Amundson Bakke, Lars Aslesen, August A. Rauben, A. E. Rauben, Emil Bern, Iver Olsen Marftad, Nils Olens Haugen, Martin Iversen, Theodore Iversen Morstad, Iver T. Morstad, John Bjeaketvedt, Robert Halverson, Peter Strobuk; Benj Storbuck and Luis Hansen. Leaf Mountain is one of the most rugged townships in the county and with its many lakes, precipitous hills with their corresponding deep valleys and with stretches of prairie land, this township presents a varied topography which is ever a delight to the eye. 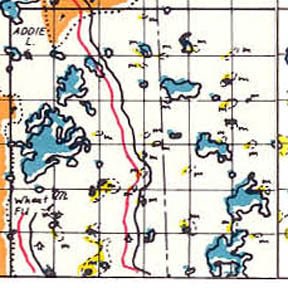 Scattered over the township are Lakes Spitzers, George, Jessie, Samson, Tom, Johnson, Olson, Line, Christian, Monstad, Edward Moling, St. Mary, Joseph and Belmont, while many others of lesser size may be found here and there. The township is drained toward the south, although there are many landlocked lakes with no outlet. No railroad has ever broken the quietude of this township, no village has ever reared its head, and the one postoffice, located in the northern part of section 9, has long since disappeared. With no urban population this township has remained essentially a rural district and its people have devoted themselves to agricultural pursuits altogether. With the introduction of improved methods of farming those who engage in this most ancient of occupations have been able to wrest from the soil a comfortable living and the many thrifty farmers to be found here bear ample witness to success which has attended their efforts. Many years ago some one made the startling announcement that gold was to be found in the township, and for a short time the people had visions of wealth floating before their eyes, but with the discovery that the supposed gold was nothing other than pyrites, the bubble burst. Places of birth for Leaf Mountain Township in the 1905 state census. The following names have been extracted from original land records (by John Nelson) and Mason's History (by Karen Terry).